Located on the famous Crescent Beach of Siesta Key, this beachfront garden-view property comfortably hosts 4 adults or a family with children. With amenities such as tennis courts, a saltwater pool, a white-sand beach with private chairs, and a large bar-b-q and sunbathing deck to watch the incredible sunset and share meals with friends, you can please all of your guests. You can also just walk the beach for miles and take photos of the dolphins. And a short drive takes you to the quaint Siesta Key Village with its shops, restaurants, and service establishments. The property has 24 hour security. Renovated in 2018, this condo is clean and well equipped. Come and create your memories here with us! Our parents purchased this condo as a vacation property for our family of seven. We, the five children, all grew up together on this beach! We all have different hobbies when we vacation there - our brother fishes, some of us golf, some of us walk the beach every morning, and others visit the various malls. We also love the Ringling Museum and the Marie Selby Botanical Gardens. Our kids especially love the Mote Marine Museum! The area has matured as we have matured, with award winning restaurants and well-attended art festivals of various kinds. Because our lives are busy and we are not always there, we are happy to share this little piece of paradise with other families that would like a holiday spot that they can return to year after year. The best part of the vacation for families is the convenience factor. Three airports are nearby: Sarasota SRQ, St. Petersburg and Tampa, so booking is easy, as well as car rental. The choices are limitless. Once in the village, the Publix grocery store is just over the bridge. You will be relaxing before you know it! 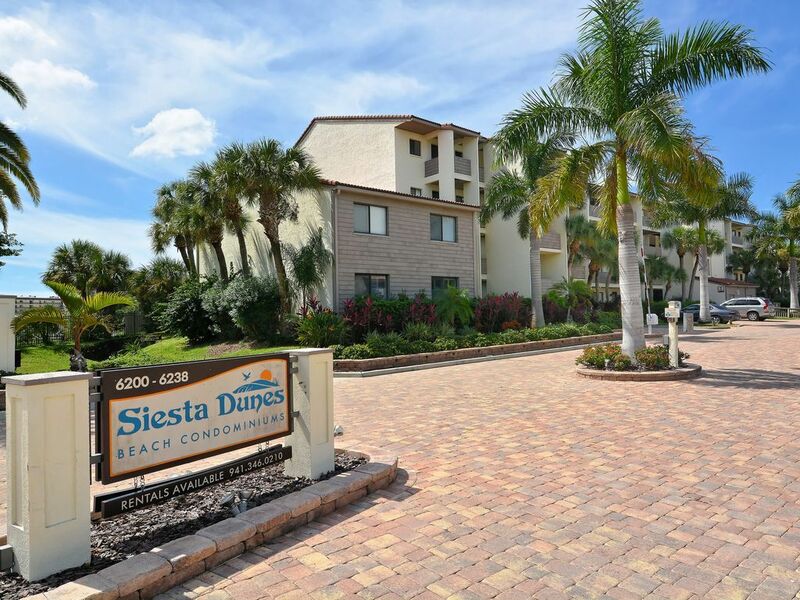 I admire the Siesta Dunes grounds; there are beautiful palm trees everywhere, the vegetation on the property is abundant and people are friendly and helpful. Join others at the deck for the daily sunset glass of wine and listen for the trumpet player who plays The Last Post as the sun goes down. It is my piece of heaven! With in-demand ice and water. If the red filter light comes on durng your stay, please let the rental office know so they can change the filter for you. The under-counter lights work on a motion sensor. Just wave your arm on either side of the stove to activate. Clean, friendly and conviently located. The property was great and the staff Amazing. The condo was clean and well maintained. Will definitely stay there again and recommend to friends. The on-site staff is amazing. They are responsive, friendly, and full of tips and information if you want it. I am so glad that you had a great vacation. This is a beautifully remodeled condo. The king sized therapeutic bed was very comfortable. The kitchen has beautiful new Samsung appliances and is stocked with everything we needed. We enjoyed eating meals in the screened in patio. The pool and the hot tub are set at perfect temperatures. Just past the pool is a large deck with barbeque a and access to the white sand beach. Katherine responded quickly to my email, offered dining and shopping suggestions and followed up with an email after our arrival to see how we were doing. Staff at the condo office were very nice. It was a thoroughly relaxing vacation. I will definitely return again. Thank you for taking the time to express your appreciation. We look forward to having you back! The condo is nicely furnished, very clean and the pool and hot tub were also great. One evening we enjoyed a nice dinner on the deck and used the grill. Our only issue was being there during red tide. The smell and respiratory irritation were just too much to even be out on the beach for any significant length of time. So when planning a trip make sure to take that into consideration. We would definitely stay here in the future. The red tide can be a big damper on a beach vacation as we know from personal experience. While usually it is mild and short, this year it has been extreme. We offer free cancellation up to 14 days before check-in to allow clients to pursue other options if necessary so I concur with Stacy's recommendation to double check. We are very pleased that you managed to enjoy some of the highlights of Siesta Dunes despite the circumstances and we hope to have you back at a better time! My family and I had a great time. The apartment was perfect. The apartment was very clean and modern. It was stocked with everything we needed from pots and pans to linens. Even had beach chairs although there were beach chairs at the beach. The pool was great. We grilled a few times during our stay and there were several grills near our building and by the pool. The complex has security which made us feel safe and we invited several friends to the beach while we were there; the staff was so friendly also. We are so glad you enjoyed your stay!